UPDATED 5NOV13 - Ok, so we are a bit behind on the build out. We are finally back on track and think we will open late NOVEMBER! Just in time for the holiday shopping season! Looking forward to wrapping some gifts with all of you! We are quickly progressing towards our goal of opening Hoppin" Grapes in Sierra Vista, Arizona. Once completed our beer and wine tasting bar will have all of the comforts of home including couches, WiFi internet, TVs and food! We need a little help to make all of this come true. Interested in helping? Click Here! to find out how you can have a part in our opening soon! November - Completing. Now that we have everything we need to open, we are putting on the finishing touches. Our contractor expects completion within the next few weeks. We needed to have a mop room build, storage room, extra A/C and heating unit installed, plumbing run and bar area built. Based on specific building code and inspections along the way, this is a busy process. Once it is finally finished, we will be able to start putting everything in its place. October - Building. We submitted our plans in early October for approval. The City had to sign off that we could begin construction. Additionally, all of our needed items for the build out were delivered. September - Planning. We had to order all of the furnishings and furniture, select a contractor for the build out, and select wine, beer, and inventory to stock our store with. We selected an architect firm to complete our drawings and store layout plan. August - Licenses. We secured a beer and wine license earlier in the year and spent August completing the process to assign it to our LLC and the location. Back in July, We marked off our wine tasting area, wine and beer bar, retail space and lounge area. Using these measurements, we brought in some contractors to give us quotes on construction so we can work through some cost figures. Our family, friends and business contacts continue to support and encourage us as we move towards opening. We started to post ongoing construction photos from inside the store so you can watch our progress as well. You can find all of that on our facebook and twitter accounts below as well as on our kickstarter.com project. Feel free to follow us on facebook and twitter since we will ask all of you for input on wine selection, beer selection, food ideas and more! 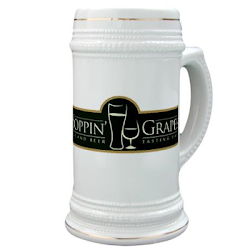 Your friends at Hoppin' grapes!